There was snow on the peaks. In northern Italy they always say you can spend the morning on the beach and go skiing in the afternoon, although in my experience even the balmy Tuscan coast is never quite balmy enough in February to tempt me into the water. I also couldn’t help noticing that the beach was completely deserted. Nevertheless, it was sunny, and it felt like spring off Viareggio on the day of our test, with the wintry mountains lending a backdrop of dramatic splendor. 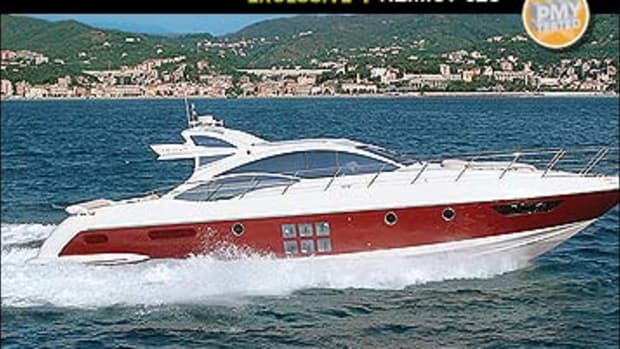 It seemed appropriate to be testing such a grand motoryacht amid equally grand surroundings. 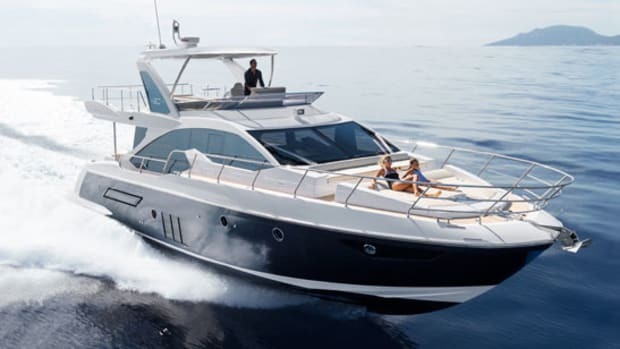 The Azimut 85 was launched at last year’s Genoa Boat Show, and although it’s tough to attract much attention at that most competitive and dazzling of shows, there was a definite buzz about the 85. 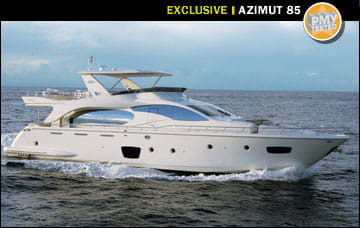 It helps to be big, of course, and the 85 is an imposing vessel, which promises particularly voluminous accommodations. Then there was that flying bridge, which looked huge under that enormous hardtop. 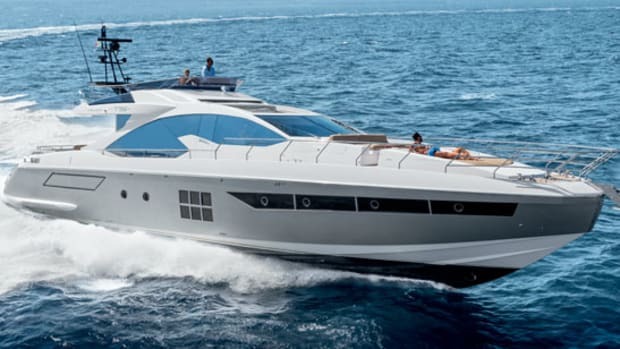 And everyone also knew that this new Azimut was the first yacht in Italy to be fitted with the 1,825-hp Caterpillar C32As, so her potential performance was also a talking point. But it was Carlo Galeazzi’s interior that was the cause of most of the gossip—and especially his intriguing main-deck layout. It’s all about the galley. The temptation for designers on boats like this often seems to be to try and minimize the galley’s impact, running it narrowly along one side so as to create through-views from cockpit to helm, in an effort to make the main deck seem as roomy as possible. On a smaller boat that might make sense, but Galeazzi realized that on an 85 with a helm set this far forward, you don’t have to create an illusion of space—because there is plenty of the real thing. 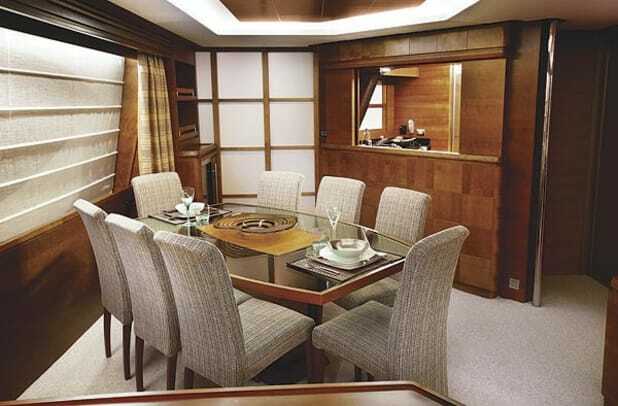 So the galley is the focus of the 85’s main deck: It sticks out well over the centerline in a diamond shape, with the dining table set on a diagonal. The result is at once interesting and practical as well as perfectly spacious. 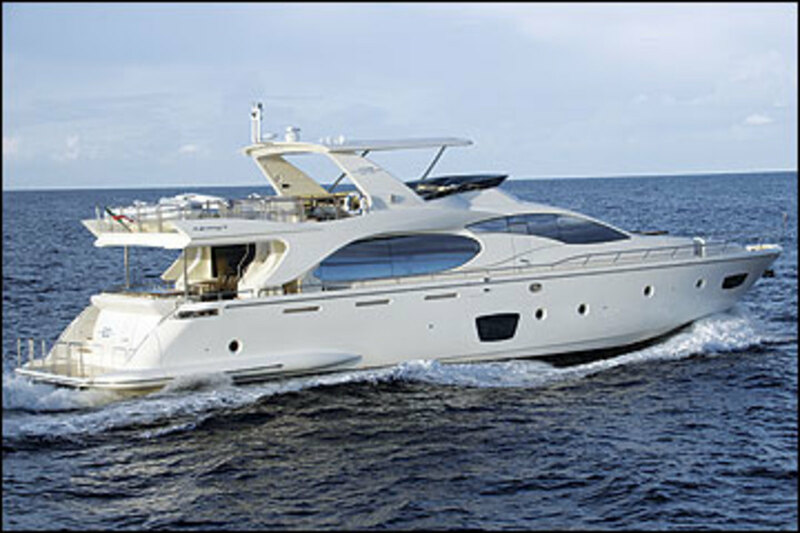 The galley, of course, is huge—and with sliding screens fore and aft and doors leading both into the saloon and out to the side deck, it is exceptionally versatile for the crew. Two alternative layouts are offered below, both featuring a pair of twin-berth guest cabins, a VIP suite in the bow, and the master stateroom amidships. Two crew cabins occupy the stern. 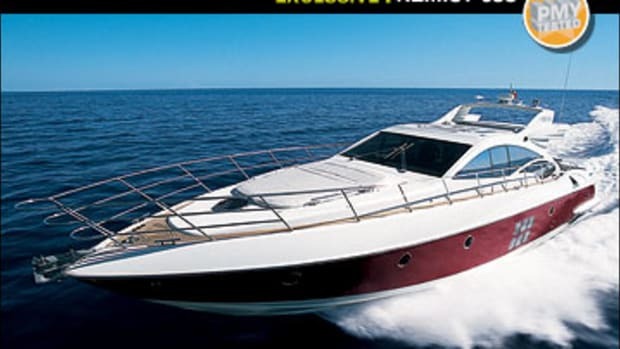 The English owner of this first 85 had opted, quite sensibly in my view, for the “owner” layout, which borrows space from the forward guest accommodation on the starboard side to create a large dressing area—a sort of antechamber—leading towards the head. There is also a shower room on the port side. Added to the already generous proportions of this full-beam suite, this option really gives the owner something in return for signing all the checks. It’s quite a long walk from one corner of this suite to the other—you wouldn’t want to forget your socks. It’s unlikely that your guests will notice if you decide to pamper yourself with the owner layout, however. The twin-berth cabins are a good size, although the one to port has more floor space and lockers and also has a roomier head compartment than its opposite number. The forepeak VIP seems especially light and spacious thanks to those big topside windows, and although it seems low on stowage at first, there is in fact a huge locker under the berth. The show gossip had been right so far: There was indeed plenty of volume in the 85, and the accommodations have been cleverly designed to make the best of it. And sure enough, the main-deck layout was a tour de force, breaking all the rules and coming up with a new set of its own, which others are sure to follow. There was also the small matter of the flying bridge, of course, all 40 feet of it, shaded by that gigantic fixed hardtop. 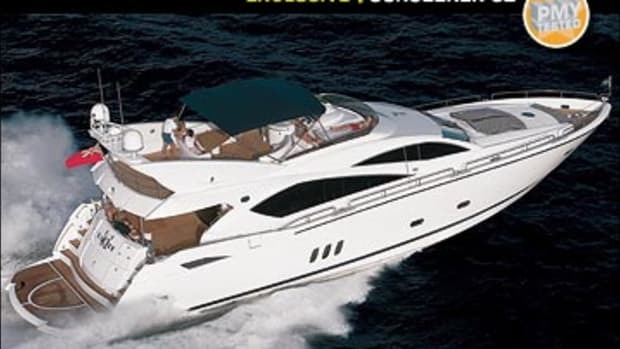 With its massive table and sofa, hot tub, tender stowage area, a bar, and two big sunbathing areas, you could lose a dozen guests up here and not see them all day. For more secluded outdoor living, particularly in port, the foredeck dinette with its optional bimini top should prove to be another favorite spot. There was just one more thing to check out: those Cat C32As. 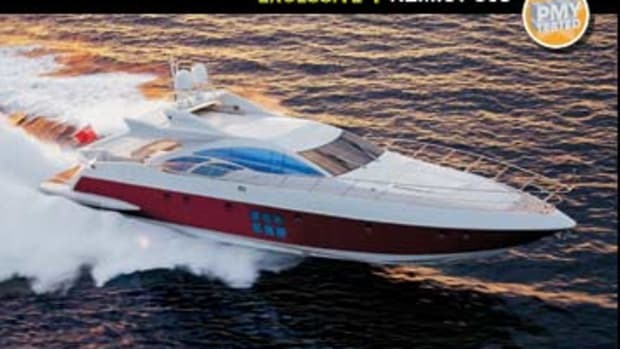 This yacht displaces 80 tons in seagoing trim, but you really wouldn’t know it, thanks to the immense torque available low down the rpm range from the new Cats. On a calm sea off the long, sandy—and deserted—beach at Viareggio, not much happened at first. But as we pushed the throttles through about 1500 rpm, things started to pick up quickly. 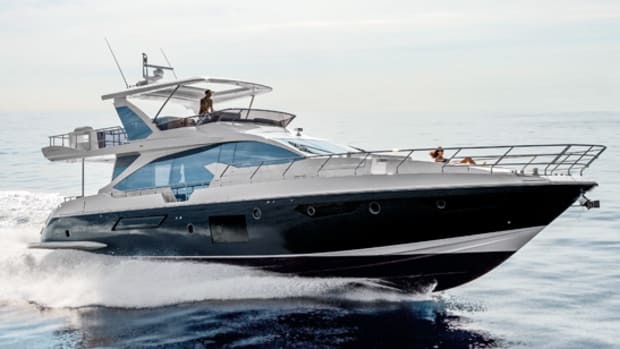 Being such a big boat, the 85 had a certain unflappable stateliness on the flat water, so when we saw 25 knots on the log, it didn’t seem quite right—especially as Azimut has taken great pains with soundproofing and insulation on this boat, so sound levels at the lower helm, even at full speed, were remarkably low at 75 dB-A (65 dB-A is the level of normal conversation). Of course torque is not just good for acceleration. With 80 tons teetering just on plane, it takes thousands of foot-pounds to keep it there, and in spite of a relatively deep 17-degree deadrise aft, I found the 85 planed quite sedately at around 15 knots. This could prove useful in choppy conditions, when you want to minimize slamming without resorting to displacement speeds. 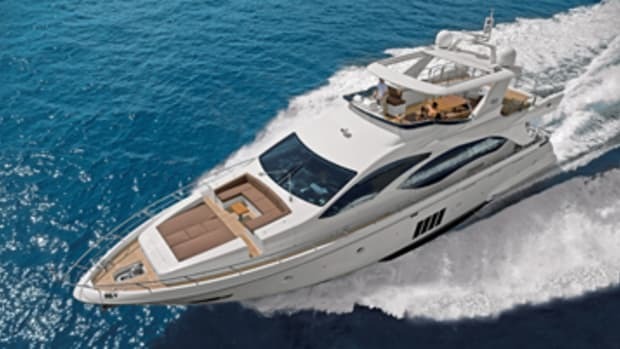 In tight turns, too, the torque stops the revs from bleeding off, so in spite of her bulk, the big Azimut has quite a sporty feel—although of course she’s hardly a floating Ferrari. More a floating penthouse. Or maybe a floating ski chalet? But the afternoon shadows were lengthening. As I wrapped up the test and put the gear away, the snow-capped mountains of the Apuane Alps were looking more distant than ever. We wouldn’t be taking to the pistes today. Water-skiing, anyone? 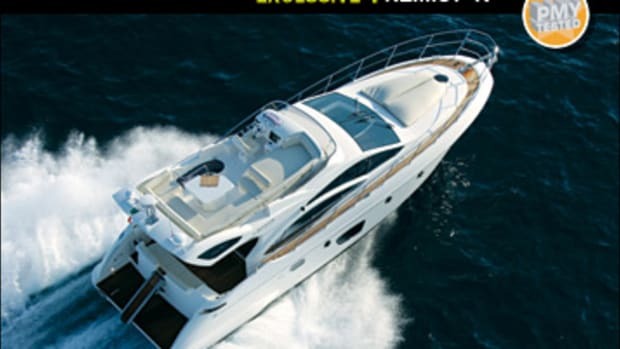 This article originally appeared in the April 2006 issue of Power & Motoryacht magazine.